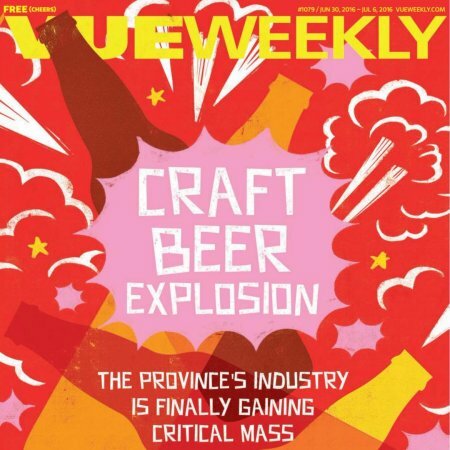 EDMONTON, AB – The latest issue of Edmonton alternative newspaper Vue Weekly is its annual Beer Issue, featuring a number of articles by beer columnist and blogger Jason Foster. The cover story is a look at the rapid growth of the craft brewing industry in Alberta, where 10 new breweries have opened so far this year, and at least 26 more are in various stages of planning. Also in the section, Foster offers some thoughts on current trends in craft brewing including kettle sours and canning, and also debunks some popular beer myths. The Vue Weekly Beer Issue – cover date June 30th to July 6th, 2016 – is available now in street boxes, shops, restaurants and other locations throughout Edmonton.